Jazz’s avant-garde lost another of its blessed progeny Monday, October 18th: Marion Brown, one of the eleven players that participated in the recording of John Coltrane’s landmark Ascension, has passed away. 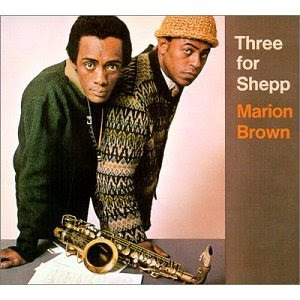 Other than his part in Ascension, he was also best associated with Archie Shepp, who’d brought him into the Impulse! fold. Brown dedicated his own Three For Shepp out of gratitude, mimicking Shepp’s own Impulse! dedication/debut, Four For Trane. All About Jazz interviewed Brown in 2003. There's also a wonderful article penned by W. Kim Heron that can be found at Metro Times' "Music Blahg."